Poonam describes how her parents came from India and worked hard all their lives to establish themselves in England. 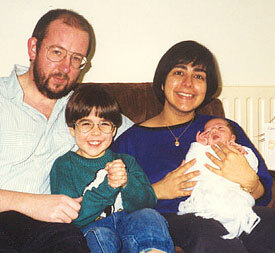 Poonam White was born in India and came to England in aged 7 years. She describes how her parents came to move here, and how they worked hard all their lives to establish themselves. I was born in India and came to England in 1963. Dad came the previous year and suffered a really difficult winter on his own, before Mum and I joined him. We’d been used to quite a reasonable standard of living; in India we had servants, and mum and dad were both from an educated and liberal family. Here we lived in rented lodgings. Dad had an office job, as did Mum, but their qualifications in India would have led to them having better jobs. We could all speak English before we came. It was Dad’s idea to come; he was a restless soul. They were happy, though I think Mum really missed her own extended family. Having started off in rented lodgings, by the time we’d got to late 1960s they had our own house in Ilford, because they had worked and saved. It was a proud achievement for them. They had come from Sindh originally. At the time of partition in the late 1940s, there were quite a lot of riots and killings. They and their peers had to leave absolutely everything behind, their businesses and their homes. So that was a huge change – and then when they came here, for a second time they couldn’t bring much with them. They always worked, the pair of them, they always worked. Mum had a job from the word go, because my Dad got her a job in the place where he worked. She worked right up until she retired. She was due to retire in two weeks when Dad died in the middle of September 1985. He had, like many Asian people, quite a diseased heart (I think it’s a genetic tendency) so he was an invalid really from his mid 50s. He had by-pass surgery when he was about 58. He worked until he became physically frail. I think, even after his first heart attack, he went back to work. 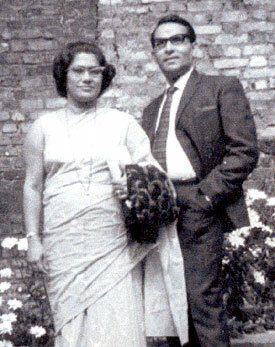 Before the bypass, Mum and Dad went back to India. It didn’t really work out. They had spent so long living here; they had become used to not going to the abattoir to get your meat and stuff like that. It was just very, very different for them. They stayed away about a year and then made the decision to come back. They found a flat near my husband and I in Isleworth. That’s where Dad died. Mum came to live with us for 16 or 17 years. Towards the end of her life, she was increasingly frail, and she died in October 2004. This page was added on 18/08/2006.